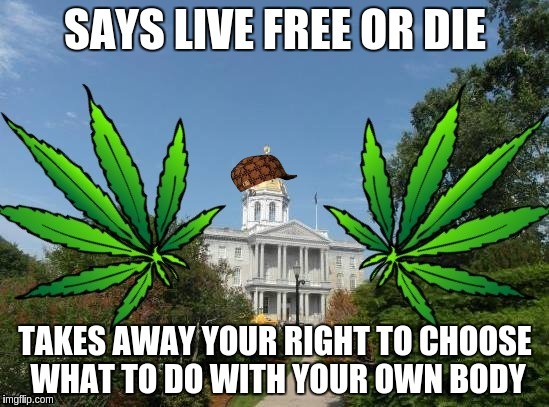 Posted on 2015-12-22 Categories UncategorizedLeave a comment on Please let NORML send your opinion on decriminalization to NH Politicians! I updated http://420at420.org/about, and added a playlist of footage from the original Keene rallies. It was fun to watch, so I decided to post it for those who want to find out what the original rallies were like. If you know where to find more early footage, please let me know so that I can add more videos to the list. Don’t forget to RSVP for this year’s annual rally. You can find the Facebook event here: http://420at420.org/event. Maggie Hassan, Governor of New Hampshire, has been working hard since she took office to make sure that it is eeasier to get Opiates than it is to get Medical Marijuana. Any doctor, with no special controls, can prescribe deadly and addictive drugs, like Methadone, Oxycodone and Fentanyl, while they cannot legally prescribe Marijuana to anybody, due to Maggie Hassan’s foot dragging and outright hostility. Even when it is available medically in New Hampshire, likely after Maggie is out of office and no longer able to obstruct progress, it will require a special card to obtain it, it will have to be obtained by a tiny cartel of dispensaries (run by the politically connected) and unlike any other drug in the world, it will be limited to use for specific government approved disorders, and Opiate addiction is not one of them. Marijuana must be harder to get than Opiates, Maggie says, because of the gateway effect. Some small percentage of Marijuana users might go on to use really dangerous drugs; like Opiates. But this makes no sense: A few Marijuana users might eventually use Opiates. Opiate users are using them right now. The “treatment” offered to Heroin addicts sheds further light. They are treated with Legal Opiates, provided by Maggie Hassan’s cronies in Big Pharma. That’s not a treatment at all … it’s just shifting profits. The drugs they use — Suboxone and Methadone — offer more severe withdrawals than illegal Heroin. This is one of the reasons 12-step programs advise against their use. Maggie’s substitute for a terrible addiction is a worse one. Are there other ways to treat addicts? Scientists are finding ways to treat Opiate addiction, using safe but illegal drugs. Unfortunately, Government is doing all it can to obstruct their research. Some results, however, are starting to trickle in. Recovering Opiate addicts are more likely to stay clean if they smoke Marijuana than if they do not. Opiate addiction may well be curable for life by three therapy sessions assisted by Psilocybin. This would be terrible news for Big Pharma. Curing disease is not as profitable as holding it in abeyance. It is not just Big Pharma that benefits from prohibitionist policies. 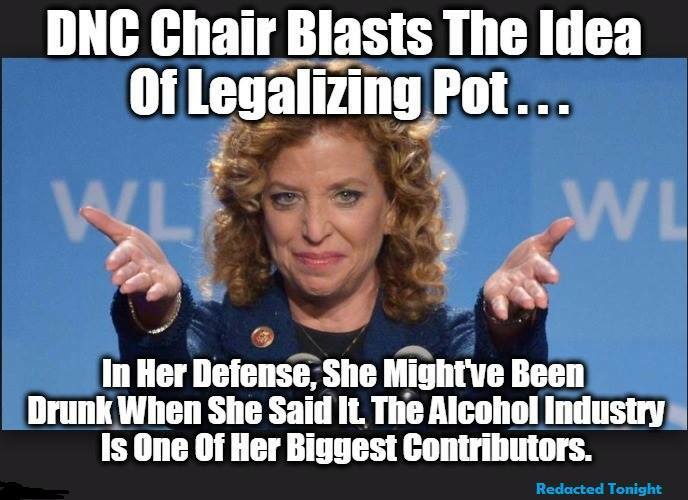 Marijuana prohibition forces those who want to obey the law to prefer deadly alcohol to safe recreational Marijuana. The Prison/Industrial complex and the Police Unions love the drug war. They get more power, more toys, the ability to steal your money without any evidence of a crime, more overtime and more slave labor by prisoners caught up in Maggie’s “solution”. Of course, they love Maggie. The Chemical Dependency Industrial Complex also appreciates Maggie. Governments force people into their treatment centers before they are ready, which means that they end up going to treatment several times before they get clean. Governments force people into their Methadone programs, so they can keep making money off them forever. Governments force so many people to go to 12 step programs prematurely that they sometimes harm the effectiveness of these programs, which are the only ones to show any success. The “Treatment” offered by “Treatment Centers” primarily revolves around driving them to AA and NA meetings, or bringing such meetings to their centers. In summary, Maggie Hassan’s solution to the Heroin epidemic, giving more money to her Cronies, is not working, and it is not going to work. She should get out of the way, and let people solve their own problems, rather than destroying their lives by putting them in prison. Prison is NOT a safe and effective treatment for any medical disorder, including addiction. It is a place for those who harm others, not for those who harm themselves. Thank you for writing your excellent article, “Medical Marijuana in Timid New Hampshire“. Knowing a little bit about your history helped me understand where you are coming from. Perhaps knowing something about my history will help you understand my perspective. I have supported ending the insane “War on Drugs” for a very long time. I was an 12-step group member for 22 years, and sponsored many young people. There was a pattern I observed: A kid would get busted with some drug, go to a 12-step group, get sober, and turn out to be a decent kid. Then the charges would roll around, and the kid would go off to prison for a while. Sadly, the kid who came back from prison was rarely the same decent kid who went in. I have often compared it to having been buried in Stephen King’s Pet Cemetery. Prison is not, apparently, a “safe and effective” treatment for the disease of Alcoholism a/k/a Addiction. The “get tough” approach to Addiction does not work. The medical approach to Addiction does not work. What works is the Spiritual approach to Addiction, which is a Spiritual malady. That is provided very cheaply by AA, and NA, and many other fine 12-step programs. My commitment to medical freedom was galvanized, as I watched the woman I loved die of Cancer. The government was wrong in many ways. It was not just forbidding Medical Marijuana. It was refusing her the hysterectomy she requested, saying that she was “too young” to make that decision for herself. It was refusing to allow her to attempt the experimental treatment which my father, who was Dean of Pharmacy at the University of Michigan, suggested, because the paperwork would take 3 months to go through, and “she would be dead by then” without the treatment we were trying to get permission to administer. It was refusing to allow her to try Naltrexone, an opiate antagonist, which has been shown in animal tests to prevent opiate intoxication while leaving the analgesic, or pain killing, properties intact … combined with opiate painkillers, it kills the pain without destroying the mind, and probably reduces the risk of addiction, since the patient does not experience intoxication. But they want us addicted to painkillers, they have proven that again and again. That is why any doctor can prescribe the most addictive drugs on earth, but you need special infrastructure to dispense the safest drug on earth, Marijuana. Why do they say that Marijuana needs to be controlled so much more carefully than Oxycodone? They claim … don’t laugh now, I’m sure they’re trying … that smoking weed can lead to using harder drugs like Oxycodone. Let that sink in for a minute. When you can take it no more, laugh or cry, I have done both. This is why I have sought to legalize recreational Marijuana rather than medical marijuana. I want the patient to choose for him or herself how she should be treated, not left at the mercy of a Doctor whose interest is in helping himself, rather than helping her. The power dynamic of the doctor-patient relationship is backwards in the United States, and it is because of government meddling, and of not allowing people to do what they know is right, regardless of whether they can convince the Doctor’s Cartel to allow them to do it. Not only recreational Marijuana, but “recreational” hysterectomies should be permitted, if that is what the patient wants. The doctor should advise, but not decide. He should, of course, be free to refuse to participate in an action which he deems medically questionable or even foolish, but patients should be free to seek a provider who will perform the procedure, even one who is not a member of the Doctor’s Cartel, the AMA, or licensed by the state. Only true competition can restore sanity to the US medical system. And that means ending the war on Big Pharma’s competition. The last straw for me was Julie’s last days, as I agonized over when her suffering should be ended. She did not want to be kept alive if she was not reasonably expected to regain consciousness. That was her wish. But rather than simply considering what was good for her, I had to be distracted by the consideration of how much Prison time would result for me, when I carried out her wishes. The fact that our “rulers”, who fancy themselves our owners, had the unmitigated gall to insert themselves into this intensely personal decision was when I realized that they were too ignorant and too arrogant to ever be permitted to make decisions for others. And it was this which led to my determination that nobody was fit to wield such power. This coming 420 Rally is going to be a much bigger show than it has been in the past, we have a couple of bands booked, a stage donated, a big tent in case of rain, and State Reps who will be speaking and answering questions. Please check out the event! You can direct people to the URL: “http://420at420.org/event” which will point to the FaceBook event page. This shortcut will be updated every year to point to the new event. Come invite all your 420 friendly and/or liberty friendly friends. Also, check out our parent organization, the Church of the Invisible Hand, at http://facebook.com/church.invisible.hand.